Recently retired NASA scientist James Hansen (along with lead author Pushker Kharecha) published an article in Environmental Science and Technology that made a powerful assertion: nuclear power is good for us. What the authors did in this study was put methodology and numbers around something many of us have understood for a long time: even without considering climate change, combustion of fossil fuels is bad for our health to a level that nuclear fission just can’t match. Here is the abstract with the key findings and figures. Lest you submit to Abstract thinking, the full article is here: Prevented mortality and greenhouse gas emissions. In the aftermath of the March 2011 accident at Japan’s Fukushima Daiichi nuclear power plant, the future contribution of nuclear power to the global energy supply has become somewhat uncertain. Because nuclear power is an abundant, low-carbon source of base-load power, on balance it could make a large contribution to mitigation of global climate change and air pollution. Using historical production data, we calculate that global nuclear power has prevented about 1.84 million air pollution-related deaths and 64 gigatonnes (Gt) CO2-equivalent greenhouse gas (GHG) emissions that would have resulted from fossil fuel burning. Based on global projection data that take into account the effects of Fukushima, we find that by midcentury, nuclear power could prevent an additional 420,000 to 7.04 million eaths and 80 to 240 GtCO2-eq emissions due to fossil fuels, depending on which fuel it replaces. By contrast, we assess that large-scale expansion of natural gas use would not mitigate the climate problem and would cause far more deaths than expansion of nuclear power. Just how can this be? To put it simply, fission is not combustion, and waste is not pollution. 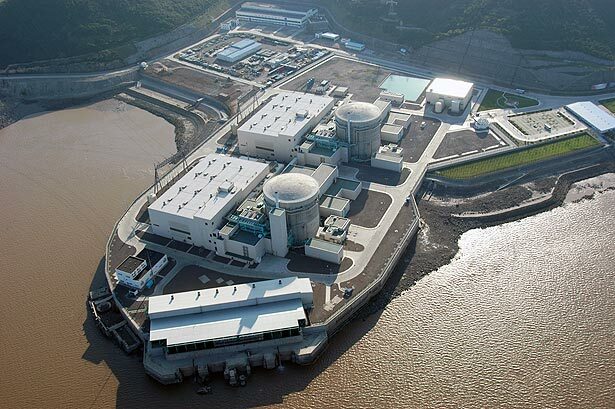 Have a look at this shot of two reactors in China. You may notice something. Rather, you may notice the absence of something. A chimney. A stack. An exhaust pipe as it were. There isn’t one. Unlike fossil combustion, nuclear fission does not expel harmful waste products all day long. The same goes for biomass. I found the open fire cosy and romantic for a night of roughing it in a hut over the Easter weekend, but smoke is really, really bad for your health over time. Nuclear fuel enters a reactor as a ceramic and leaves again as a ceramic. There’s no smoke, no exhaust. There is waste. But not pollution because the waste is contained as standard operating procedure. Even that waste is just another type of fuel. You just need the right reactor. As the recently published paper makes clear, the cumulative impact of the nuclear power in use is nearly 2 million deaths prevented, and in future it will be millions more, even taking highly conservative assumptions about the health impacts from the nuclear sector (as the paper has done). To bring this all back to something real, lets visit Australia’s National Pollutant Inventory, and look up a few well known air pollutants: PM 10 (larger particulates), PM 2.5 (smaller particulates), oxides of nitrogen and sulphur dioxide. Let’s see check the contribution, and ranking, from two sources: electricity generation and coal mining. Those are the big ones. To review every pollutant reported for Australia’s fossil dependent electricity generation sector in the NPI, click here. To review every pollutant recorded for coal mining in Australia, click here. When I said to an audience that we could have a future without air pollution, this is what I was getting at. So much of what harms us that we either accept, or remain completely ignorant of, can be completely eliminated by rebooting our energy system with a judicious combination of nuclear power and renewables. We need to eliminate coal, head off a major reinvestment in gas, then develop substitutes for our liquid fossil fuels using the clean energy. If we incur pollution for other benefits, where simple substitutes don’t exist, well, ok… at the very least we need to have a discussion of trade-offs. Here, there is no trade off. It’s all upside. Dramatically less mining (and transport) for the prodigious volumes of fuel. The elimination of huge amounts of air pollution. Vastly safer. The transition to nuclear is a valuable evolution of our civilisation without the urgency of climate change. We need to ditch our dependence on 18th century fuel, and embrace the technology of the 20th and 21st Century. It’s better for us. Add into this Nuclear Medicine and radioactive isotopes. Realistically you can treat lung cancer with Nuclear Medicine. Another +1 for Coal to Nuclear shift. Add bacteria killing. Add detecting flaws in air craft parts. Nuclear is, all told, the mostly poorly understood, maligned, wonderful technology development of the 20th Century. Spencert Weart charts the changes in perceptions and imagery in his book “The Rise of Nuclear Fear”. Deep greens will say the problems with coal mean we must increase our efforts to reach 100% renewables. They’d like medical isotopes to be produced with cyclotrons, not reactors. I’d add 34 gigatonnes of global man made CO2 to the annual pollutants list. Living in a hydro region I’m a bit freaked out by the dry autumn about 3-6C warmer than average. Lost hydro output will be replaced by coal and gas since renewables can’t be increased at will. Still not entirely convinced about some of those facts. As I see it, the Latrobe valley is bathed constantly in pm10 and pm2.5 particulates. That’s about 75000 people within 25 km of those four brown coal plants, that have been operating since the 1920s, with far dirtier technology than is currently available. If particulates wre as dangerous as some literature states, then the signal of deleterious health impacts in that concentrated area would be plain for all to see, it would not possibly be something that wasn’t common knowledge. However, this isn’t anything like Wittenoom or Beijing or anything comparable, in fact there is no evidence that I’ve been able to find that indicates that valley residents have substantially increased asthma, or respiratory illnesses or anything. These are socially depressed areas that burn firewood regularly, so they would likely have a higher rate than the Australian average, but there isn’t the evidence that all these people are keeling over. So something doesn’t pass the sniff test. erm, bashed out quickly, sorry for the lack of para breaks and intelligibility. You will need to give me a little more. 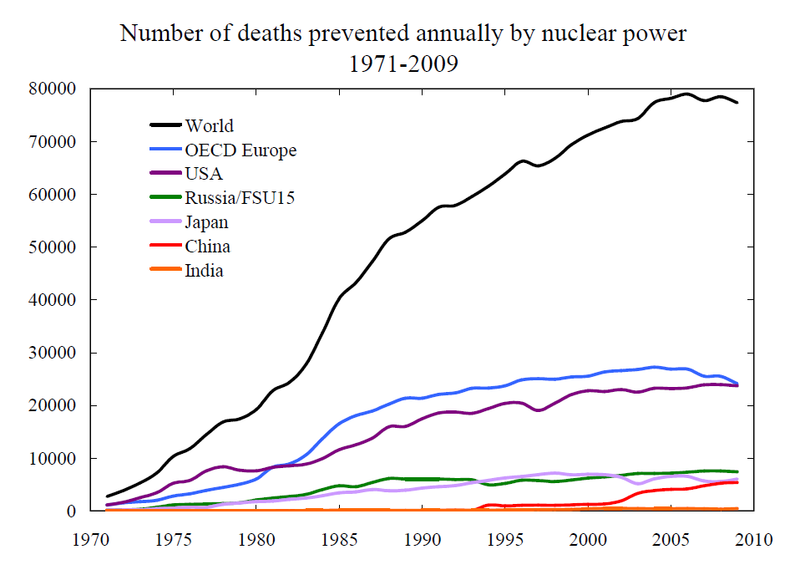 As far as the sniff test goes, if you took a small, but true mortality impact across the full reach of nuclear/fossil power and the full lifetime of the nuclear power industry (about 1970 as shown in the figure), to come up with 1.8 million prevented deaths seems entirely within reason to me. If there is something to critique in the paper, critique away. As for the Australian coal regions, I am aware of concerns from medicos as mentioned below by John Bennetts, but am yet to find any good epidemiological work one way or the other. So I can say nothing with certainty. I am aware of reputable international work that has been extrapolated to some Australian settings, including work by the very reputable ATSE, but again this is not perfect. If you have such studies please share, but I don’t think they exist. But we do know the pollutants are harmful and why. Get rid of them, and we would expect better population health. I have never seen anything to suggest the effect is not real, and plenty to suggest it is. But no doubt in La Trobe valley the wood burning and potentially elevated smoking levels associated with the lower socio-economic status would be major confounding factors. That’s what make epidemiology hard I suppose! So I disagree that the impact would be “plain for all to see”. It may well be there and be very real, but it would take a good study to show it. Wilful what are the Beijing stats? My point is that there is no need to look at foreign stats when there are local and other stats to consider. I live in the Upper Hunter Valley, NSW, where high levels of asthma and other illnesses have been a challenge for local GP’s for a couple of decades. Whether or not more serious illnesses are imminent, I do not know. What I do know is that, without those PM2.5 particles, we would not be having this discussion. Perhaps you don’t know what you are talking about. Anyone who can bring good health data to this, please do. As per my response to Wilful, there is no doubt of why the pollutants are bad for human health, but I have not seen a good study in the Australian coal heartland setting. Last night’s ABC Foreign Correspondent shows what we’re up against. Mark Willacy clambered happily over a vintage reactor in Taiwan then visited a waste repository on an offshore island. It appears to be mainly low level waste stored in drums in warehouses 12m above sea level. After 30 years of nonevents the islanders want it removed. They have primary school aged kids carrying No Nukes placards written partly in English. Those same islanders smoke cigarettes and drive motorbikes without wearing helmets. My guess is a few of them have come to grief in those 30 years but not from radiation. OTOH I wonder if Willacy is the boy who cried wolf too often. You get the feeling he’s quite at ease presenting lurid stories from the nuclear danger zone. A closet nuclear admirer perhaps. I missed the show, read the summary online. Sounds like a legitimate case of poor community engagement and lack of consent. The hazard is very likely poorly understood as you suggest, that would be normal.